Fixed income investments play a defensive role within your investment portfolio. But how do corporate bonds compare with other investments available within the fixed income asset class? Australian Government bonds are among the safest investments available to investors. Find out more about Australian government bonds. Term deposits¹ are not tradeable like shares, ETFs and XTBs but they are fixed income investments. Find out more about term deposits. Before XTBs on ASX, dealing in corporate bonds was mostly the domain of institutional and sophisticated (“wealthy”) investors trading them over-the-counter. Find out more about corporate bonds OTC. ETFs and managed funds that cover bond markets and indices are widely available to investors. Find out more about ETFs and managed funds. Hybrids are not part of the fixed income world because they have too many equity features to be defensive. Find out more about hybrids. Your tolerance to risk is an important factor to consider before making your investment choice. Everyone has a different tolerance to risk. Investors should aim to be comfortable with the level of risk associated with their investment selections. REMEMBER: More return ALWAYS equals more risk. Don’t be fooled by claims of a low-risk AND high-return investment. Bonds are low-risk AND low-return investments. 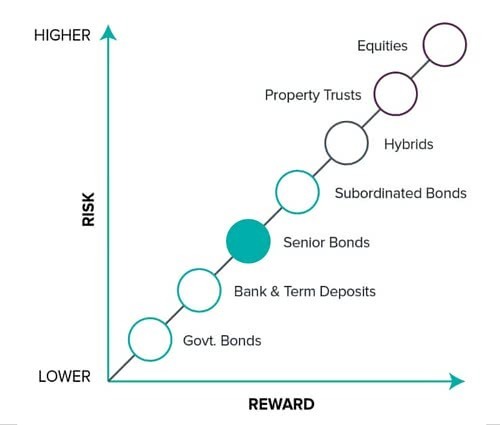 The risk vs return chart below demonstrates where each type of investment fits on the risk vs reward spectrum. A key recommendation for any investment portfolio is to diversify. This means you should hold a variety of investments across the different asset classes. This approach will leave you less exposed to events that hit a particular asset class, such as an equity, bond, or property market crash. However, it is also essential to have the right securities in the appropriate area of your portfolio. Assets that carry higher risk should deliver higher returns, but are also likely to have far more volatile returns. They may fit well in the growth area of your portfolio. Fixed income investments like Australian government bonds, Term deposits, corporate bonds and XTBs over them or Managed Funds or ETFs over these assets, all provide that defensive investment profile.